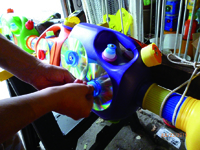 This fun, colorful activity teaches how ordinary objects can be recycled into exciting art. Students learn interactively about the re-use of materials, the principles of symmetry as applied to design, basic tool safety, and discuss how to keep plastics out of the waste stream. The workshops are great for K-12 students. Advanced workshops are available for adults. 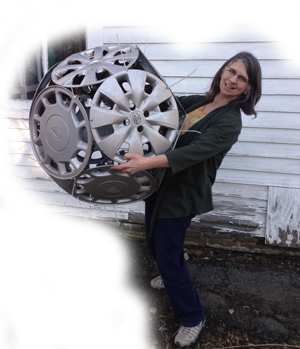 Premiering at the Worcester Center for Crafts February 2014, participants will create giant beads out of hubcaps and plastic plates. Learn to make a giant flower Lei using colorful laundry bottles and plastic fencing. 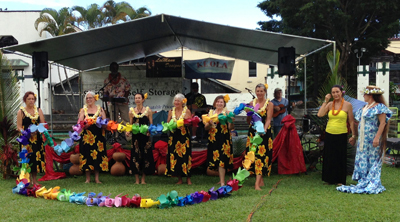 The one made at the Hilo Lei Day festival in Hawaii was more than 40 feet long. These are kinetic sculptures that wave in the wind like grass or giant lupines. 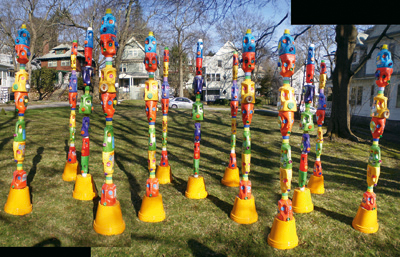 Students learn how to construct these 10-foot tall scultures using colorful plastic cups and zip ties. Most recently exhibited at the Tower Hill Botanical Garden in Boylston MA. 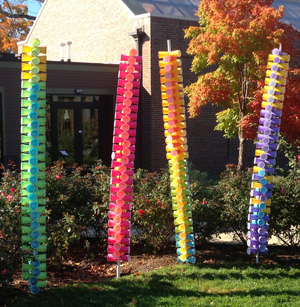 Participants are taught how to create brightly colored “tiki” heads out of recycled laundry bottles, plastic lids and CDs, then stack them on short or long poles for an exciting display.